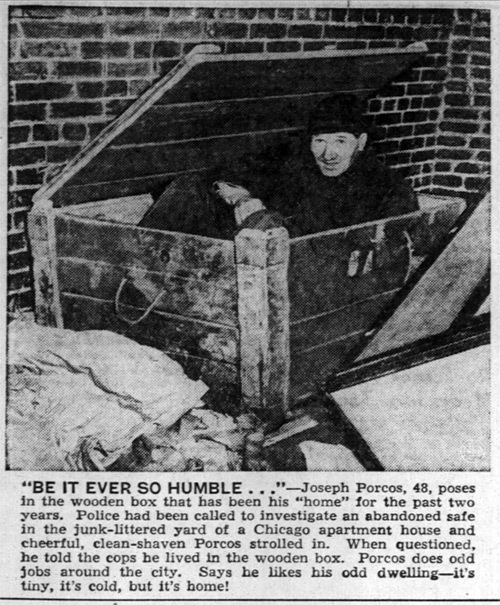 Joseph Porcos of Chicago lived in a box. In hindsight, perhaps he could be seen as a pioneer of the tiny home movement. 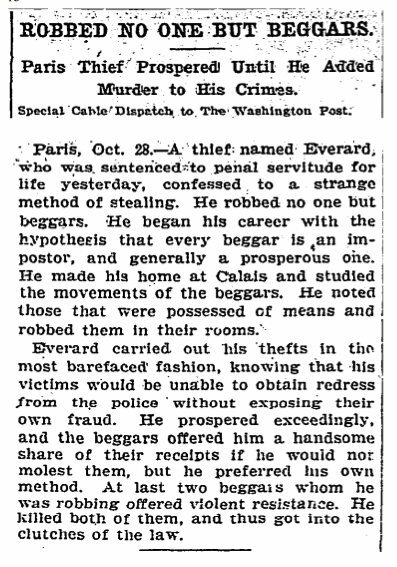 From The Washington Post - Oct 29, 1905: The Parisian thief Everard thought he had figured out the perfect crime. He only robbed beggars, and only those who were secretly wealthy — knowing they would be reluctant to report the crime since to do so they'd have to reveal their own fraud. His strategy went wrong when during one of his robberies he ended up killing two men, thereby making himself wanted for murder. Sounds like it could be the plot for a movie. 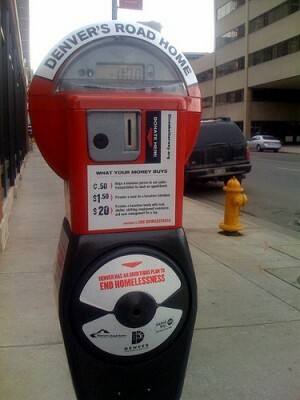 Though it makes me wonder how many beggars are there really who are secretly wealthy. Beggars who are working scams by faking injuries, disabilities, etc? Definitely. But ones who are squirreling away millions? I always assumed that was a bit of an urban legend. Not that I'm an expert on beggars, however. Do you know why jokes and pranks like these don't fly any more? Because nobody gives a damn about playing their proper role these days. I'm not even going to mention the old lady with impossible neck and sadistic habits. But just look at that hobo! His hat has the classic open-can-lid top. He's wearing a Victoria Cross medal, cravat and vest. Note how carefully he cradles his cane on his arm. Note how delicately he takes the fake biscuit, with pinky finger upraised. The magnificent scowl when he bites the rubber biscuit! You'd consider your twelve cents well spent! 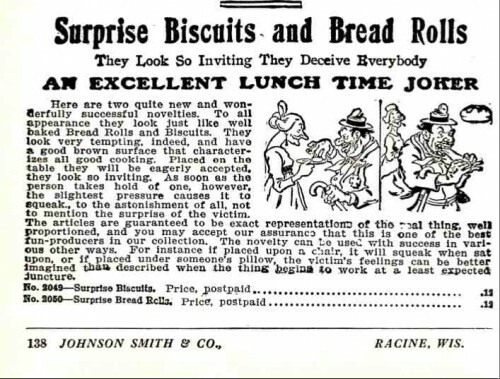 Now imagine giving a "surprise biscuit" to the modern incoherent and sloppily dressed drug addict sitting on the sidewalk outside your local liquor store. He'd be too out-of-it to even register the prank. 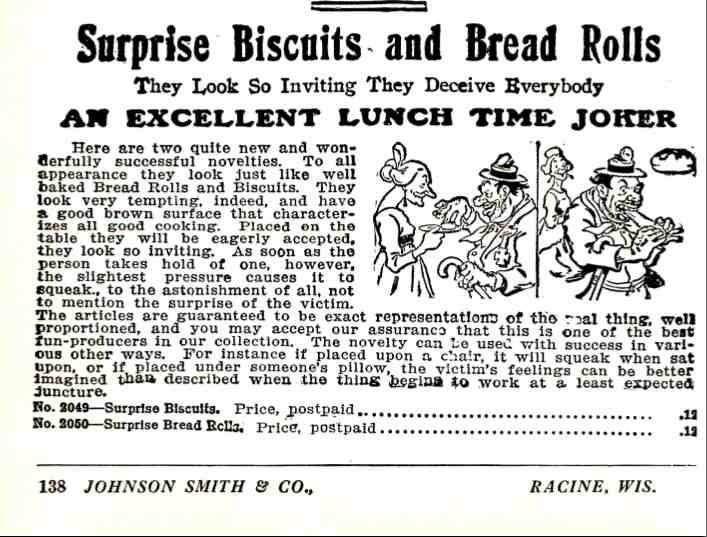 If he did, he'd just grunt and toss the surprise biscuit one side, frustrating your enjoyment of your purchase. We live in a sad age of decline. Carl Hoffman has done a few things that most of us would never dream of doing. He has flown on airlines said to have the worst safety records in the world and ridden in old buses in South America as they crawled along cliff-top dirt roads. 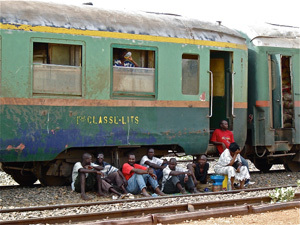 He also packed himself into already crowded ferries on the Amazon and trains crossing Africa. Why? To experience travel not as we might while on vacation, but as an ordinary person trying to get from point A to point B as cheaply as possible. Hoffman talks about his adventures here, and in his new book, "The Lunatic Express." "In the picture-postcard community of North Vancouver, local bottle pickers have created a thriving subculture of shopping-cart racing. Murray Siple, a former snowboarder and sport film director injured in a serious car accident ten years ago, captures the thrill of a high-speed race of one of the men and compares it to extreme sports." A fascinating time capsule from 1971. Thirty minutes long, but watch at least the first five or so. So long as we've started a toilet thread, let's all watch "Color It Clean," so that we appreciate the men and women who maintain our public lavatories. This film reminds me of Barney Gumble's autobiographical entry in the Springfield Film Festival. I could find the clip only in Italian, but that adds a certain frisson to the viewing experience, I think.